One of the biggest changes - and challenges - that many leaders and organizations are facing is leading teams remotely. What makes coaching and giving feedback different from a distance - and how you can do both more effectively no matter where you are! The ability to lead remotely is crucial to your success and having proof of your training and learning provides confidence and credibility for yourself and through your organization. If you are thinking of training multiple leaders in your organization, this certificate is a designation of their progress and an indicator of their future success. 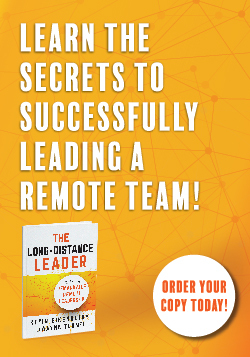 If you're tired of being overwhelmed; if you're falling further and further behind and sinking deeper into quicksand with no help in sight, and want to help yourself and your team become more successful, you cannot miss this virtual class, designed specifically to address the challenges that remote employees and their leaders face every day. Want to customize your training or interested in just one course? You can learn more about our individual courses or check out our Custom Training to find out how you can customize your learning experience.